The Everything Coconut Diet Cookbook was brought to my attention just before Christmas 2011 by a family member who came across it at Indigo books. The diet and the recipes sounded interesting, so I got a copy and read it. I had read another book on coconut and health in 2010 called Coconut Cures by Bruce Fife, which I quite enjoyed as well. Bruce Fife is quoted as a coconut authority in the Everything Coconut Diet Cookbook. This book covers the details on how coconut can be used effectively in many ways to help a person improve their health and appearance. Organic, virgin coconut oil being the coconut product that delivers the most health benefits from increasing insulin sensitivity to improving the appearance of skin and hair. Many of the ideas are small changes that many people could implement. I found the book to be an easy, interesting read. The health booster beverage, warm water with lemon and coconut oil http://www.vivianlaw.ca/health-booster-lemon-water-with-coconut-oil/was inspired by this book and Coconut Cures. A very interesting part of the book is the fairly large list of recipes that incorporate coconut products into many different everyday foods. I have tried a few recipes so far and have found them to be quite tasty. For example, I love strawberry shortcake and there is a coconut version in this book, and is also gluten free. The medium chain fatty acids found in coconut are a healthy fat, so this book is a great source of information on how to use this healthy fat for many different health benefits, much like Coconut Cures. However, the Everything Coconut Diet Cookbook provides even more practical applications and interesting recipes. I do not recommend diets at all, but this book is an interesting source of health improvement ideas to try. Most of us would like to lose fat from our bodies in select areas (see hormone fat loss post). I generally find it far too difficult to deprive myself of any food or drink, so I look for other solutions, such as making small changes. The most positive and easy to accomplish is adding more variety of foods or drinks that I consume. One of our favourite fat loss tips that we suggest to our clients is to try eating at least one cup of cooked greens everyday. Cooked green vegetables such as broccoli, brussel sprouts, collard greens, kale, cabbage, spinach, rapini, swiss chard, asparagus, dandelion greens, watercress, callaloo, the list goes on. Most of us including myself need to work at eating a variety of foods to obtain an adequate variety of nutrients. This point is very important especially with plant foods as they all have slightly different phytochemicals and antioxidants that are highly beneficial to our health. I have looked to professional chefs for inspiration with different ways to prepare and enjoy veggies, as they are the experts at making food taste and look good. I have shared a few sources of veggie inspiration in previous posts and I will continue to look for inspiration and encourage veggie consumption. 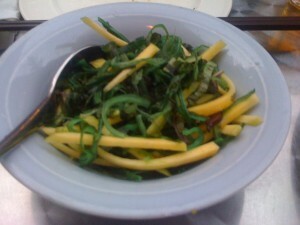 I was out for dinner twice this weekend and came across restaurants that had great tasting greens on their menu. I would not have eaten that amount of greens if I had not ordered these items. I was at Foxley (a perennial favourite Toronto restaurant) with a friend and we ordered both the green mango seaweed salad and the kale salad. Both were absolutely delicious and a substantial amount of greens. My friend and I both commented that we would not know how to prepare seaweed or kale in such a delicious way, but we were happy to eat it! 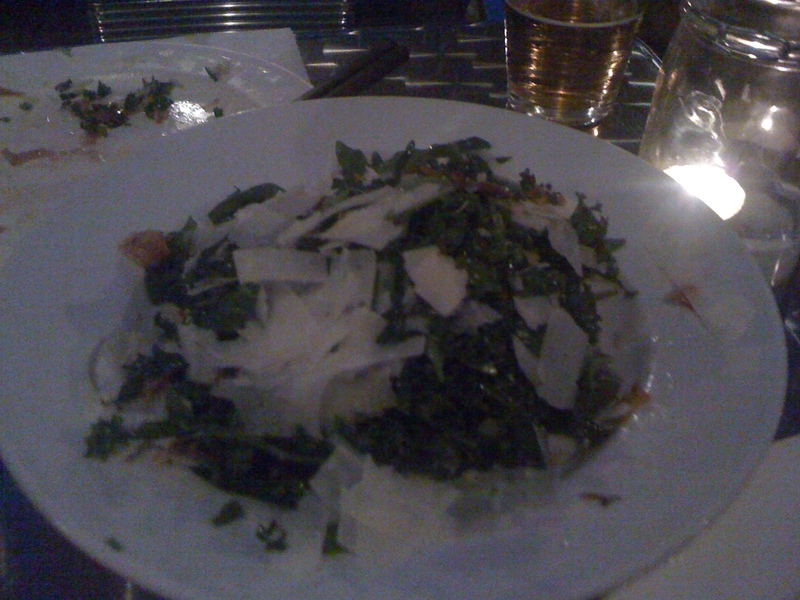 I was also surprised to find great greens at Lil Baci last night. Their tuscan kale salad is exceptionally seasoned and their fresh fava and greens were well prepared and tasty. Again, items I would not have made myself, but I certainly enjoyed eating once on a plate before me. Look on the menu the next time you are out for a meal and see if there is a veggie you are willing to try. You may be surprised that it tastes good and you’re willing to try it again. My summer drink of the moment is the Grey Goose orange with lime and soda. It is absolutely delicious and it has been brought to my attention that it is hard to stop at just one. I can totally relate to that! Once you have one tasty alcoholic beverage, it is really easy to have more, possibly many more. There is one suggestion I have for everyone who drinks alcohol-count them for yourself. I started this habit a few years ago and doing so has helped me to learn that there is an upper tolerable limit of drinks I can consume in a week. Beyond that limit, I have discovered through trial and error that my energy level suffers, I feel generally unwell and my exercise performance declines. I believe there is a balance of having fun and staying healthy. It’s a matter of listening to your body. I encourage everyone to count how many drinks they consume in a week, write it down, monitor how your body and energy level in general feels. This a positive health habit that holds us all capable and accountable for our choices in fun, health and wellness. If you have goals for fat loss, many programs will suggest you cut out all alcohol consumption. This may work for while, but long term, it is most likely unsustainable. My suggestion is to monitor your consumption weekly, as a lifestyle habit and find out what your upper tolerable limit is. Once you know your weekly maximum number of drinks is, make it your goal and general lifestyle habit to stick with having less than that maximal number. I consume alcoholic beverages. I quite enjoy them. It is true that alcohol comes in at 7 calories per gram. I don’t tend to count calories, but it is good to be aware of what amount of energy a food or drink provides and make choices based on your enjoyment of the food or drink. The calories in alcohol unfortunately do not provide any nutritional value whatsoever. However, it is of paramount importance to enjoy life. I believe this is why the science seems to indicate that people who drink live longer than people who completely abstain from drinking. If you choose to drink in moderation, here is a refreshing, sugar free and delicious summer or anytime drink I discovered when a guest insisted on having lime with their vodka soda. I did not think lime would taste good with the orange vodka, and I was incorrect. This is an exceptionally great vodka soda. Pour the vodka into a low ball glass with ice. Top with club soda and squeeze lime thoroughly. Enjoy. This is a recipe that has stayed with me for many years after trying it at a good friend’s summer dinner. The original recipe was from Gourmet magazine and used canned beans, but as I have mentioned before, I prefer to slow cook them myself for better flavour and minimal gas. The simple blend of fresh mint, garlic, lemon juice, olive oil with the pureed white beans makes for a clean and refreshing summer dip. Serve with raw veggies (ie. endive, celery, cucumber slices) or whole grain crackers. Makes a tasty, healthy snack anytime. In a food processor, puree white beans, garlic, olive oil and lemon juice. Add salt and pepper to taste. Add mint and parsley, pulse until just blended through. Enjoy! A friend and I braved the lineup to try Grand Electric for dinner last night. I had read a rave review by Joanne Kates in the winter and have meant to try it for some time. A beautiful warm night certainly made it easier, as the capacity of the restaurant doubled with their patio full of picnic benches crammed with people in every possible seat. I must admit I have been on a taco tasting mission this month. One of the motivating factors has been missing out on Rick Bayless Mexican food, at Tortas Frontera at Chicago O’Hare airport. I have had my heart set on eating there since January this year. I knew nothing of Rick Bayless when I passed by the restaurant at the crack of dawn on my way back from Hawaii in early January. I just knew the menu looked amazingly appetizing and I had to try it another time. I passed through Chicago again in May and due to many circumstances at the airport, I missed out on eating at Tortas Fronteras again!!! Tacos have been on my mind to say the least, so first stop was Tacos el Asador on Bloor. 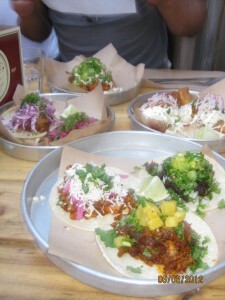 Very simple, well done, authentic tacos with their fish tacos being most exceptional. Next stop was going to be Playa Cabana, but the line was too long for the friend I was with, so we went to an old standby, Dos Amigos. After so many years, Dos Amigos does not disappoint with their blackberry margarita, cactus salad, and tacos al pastor complete with 3 sauces and pickled jalapeno. Third on the taco tour was Grand Electric. 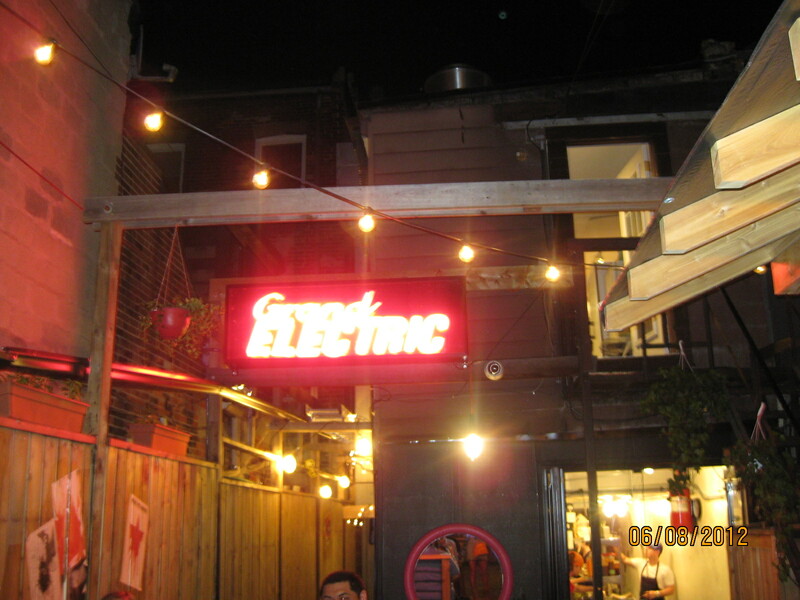 After a wait of over an hour, we were shown 2 seats at a picnic table on the patio of Grand Electric. Our tablemates were friendly, we asked for recommendations and scoped out what they were eating. We decided to order one of every taco, in addition to spicy squid, tuna ceviche, and miami ribs. I wish I could tell you which taco was what type, but that is the fun of eating here. Big, bold, intense flavours and not easily discernible meats…the fresh garnishes of cilantro and thin sliced jalapeno are a sparkling touch. Everything we had was great, although I cannot say I loved the fish taco. The key lime pie is super. So is the bourbonade. Grand Electric is first and foremost about the special, convivial experience and the food is outstanding as well. Otherwise, it isn’t so fun to wait for over an hour, squeeze into a picnic bench by a wall and deal with a ‘queue’ for the washrooms. The whole experience was unique and reminded me of another very different dining experience, Mission Chinese in San Francisco. Dining is a highly social activity and Grand Electric gives Toronto an innovative, new experience. Another point of curiosity for me was learning of another Mexican restaurant situated in Brooklyn, NY with a similar name, Gran Electrica. I asked one of the owners and Grand Electric in Toronto was open first and both restaurants appear to be inspired by the same painting, Grand Electric Skull. The Brooklyn restaurant has some big names behind it, so it will be most interesting to compare notes. Hopefully some friend will head to New York soon and let me know. I have been working on a workout and lifestyle program-Hormone Fat Loss, with a great trainer I know, Steve Elvins the past 4 weeks. I just want to share my experience, because it has made an huge impact on my body. The program started with an assessment where my body fat stores were measured at 12 sites with calipers. This was not an enjoyable moment for me, as it made me feel fat while I was getting pinched everywhere! The interesting learning experience though, was I learned from those body fat measurements that there were hormones in my body that could be better balanced so I could be closer to optimal health and function. This was very motivating for me, because I truly believe that being in optimal health brings the most enjoyment, effectiveness and happiness to my life. I was given the most thorough, comprehensive program to achieve the goal of dropping body fat from the specific sites of my body to balance my hormones. Unfortunately, I was simply unwilling to comply with a dietary regime that many consisted of greens and lean protein. I was willing to commit to working out with Steve 2-3 times a week and to make some minor lifestyle changes. I am pleased to report that in 4 weeks time I can see a big difference in how I feel and look. I will get more technical results through a re-assessment, but I know I have lost an inch from my waistline and there has been general fat loss throughout my body. The best part has been doing a different program has enhanced my performance in my usual activities of running and spinning. I just feel better and have been able to run and spin at a higher intensity with the same amount of effort. We will share further developments on the Hormone Fat Loss program with you in the coming months. Optimal hormone function is something we could all strive for to feel and look our best. Watch out for it and get ready to bring your health and physical being to your best.